What Do You Get When You Cross A Glock With An AR? When I started on the NRA Technical Staff, AR-type rifles were just starting to show up at Camp Perry. It wasn’t easy for the AR because you had old school military armorers who were skilled at and more comfortable accurizing M14s, and really no one had much confidence in the little .223-caliber bullets of the time grouping tightly at 1,000 yards. A hell of a lot has changed since then, not the least of which are the rifling twist rates and bullets for long range shooting. Plus the incredible popularity of ARs has spawned a bounty of aftermarket parts that just drop right in making these guns more suited to nearly any task from 1,000-yard competition to kicking down doors and shooting up bad guys. 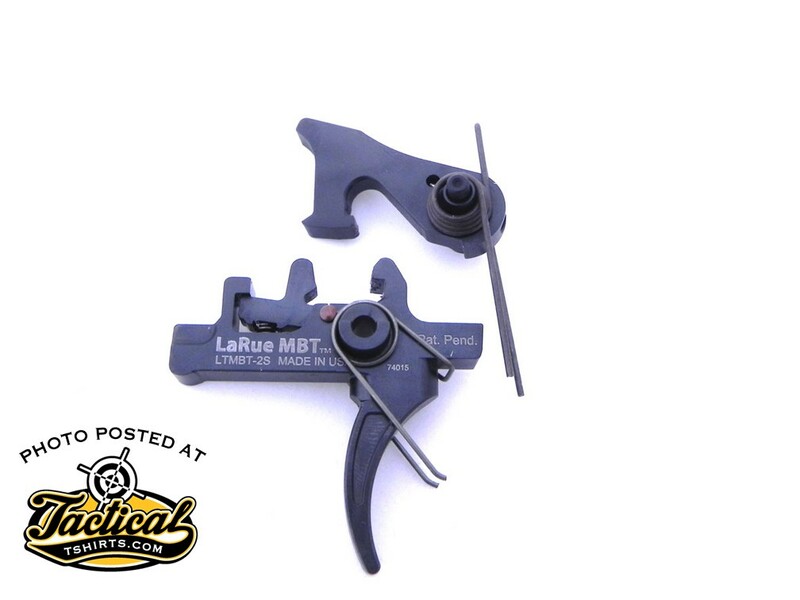 The LaRue MBT 2-stage triggers are hand-made out of solid S7 tool steel plates. 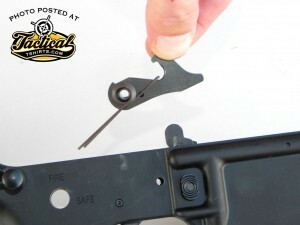 You’ll find that most rack-grade ARs have trigger pulls of between 7 and 9 pounds pull. That’s fine if your task is CQB or some other type of shooting where things are close and the target is center of mass. Stretch things out, or if you need more precise hits, and trigger pull becomes an issue. You used to have to find a gunsmith who knew what he or she was doing to lower the pull on an AR, but now it’s as simple as pushing out two pins and changing out some parts. 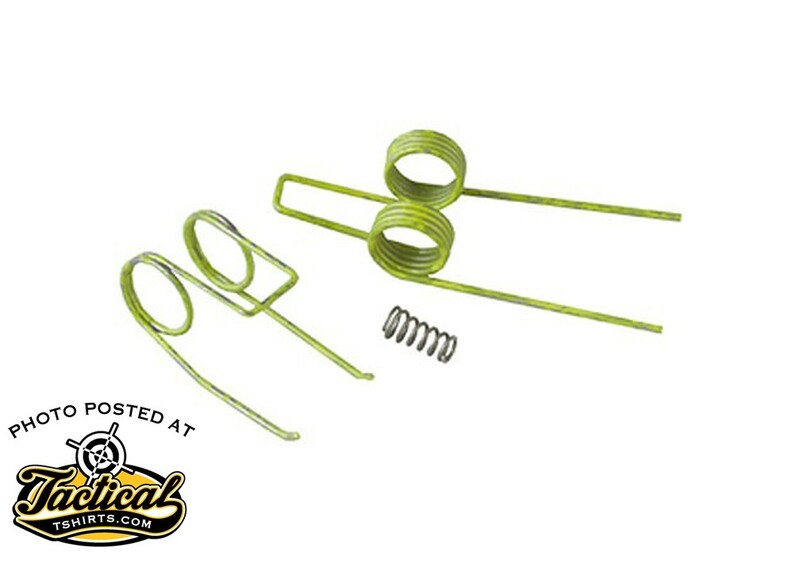 The JP reduced trigger spring kit replaces the springs in the stock AR15 trigger and costs about $12. Probably the most effective/least expensive fix is the reduced pull spring kit from JP Enterprises. These springs reduce pull weight basically by having one less wrap to their coils. On my Bushmaster, the JP springs lowered trigger pull from 8 pounds to just a hair over 5 pounds pull. The trade off for the lighter pull with these springs is reliability, so you don’t want to use them on your home defense gun and also know that you may not get reliable ignition with surplus or cheap foreign-made ammo. 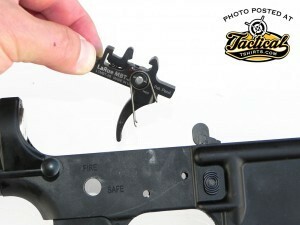 The LaRue trigger does not have a separate disconnector. Make sure the legs on the hammer spring are pointed the right direction. The next step up, which is much more expensive but reliable with all ammo, is an upgraded trigger/spring assembly. I recently tried the Meticulously Built Trigger (MBT) from LaRue and what a difference it made. On my Ruger AR556 it lowered pull weight from 9.4 pounds to a delightful 3.6 pounds pull, and I didn’t have to give up any reliability for the lighter pull.